As one burger place closes, another opens. Isn't that some kind of proverb or something? Or they were talking about a door, right? As Marlowe gave up their Marlowe Burger spin off spot, it wasn't long before another burger place moved right on in. The folks behind Causwells are pulling a Marlowe and spinning off their burgers into their own spot with Popsons Burgers. They opened a couple weeks and normally I'd give them some time to get settled, but in this case, the building they are in is on the chopping block for teardown and new build so I thought I'd try them out before the wrecking ball came swinging through. Food wise, it is a compact direct menu. 4 burger choices in either single or doubles, 3 fry choices and oddly enough a salad. Seems they have more beer and wine choices than burger types. I'll chalk that up to marketing to the upcoming baseball season crowds (and we all know how I feel about that). Personally, I don't need a lot of burger choices, makes it easier to try two different burgers without feeling like too much of a glutton. 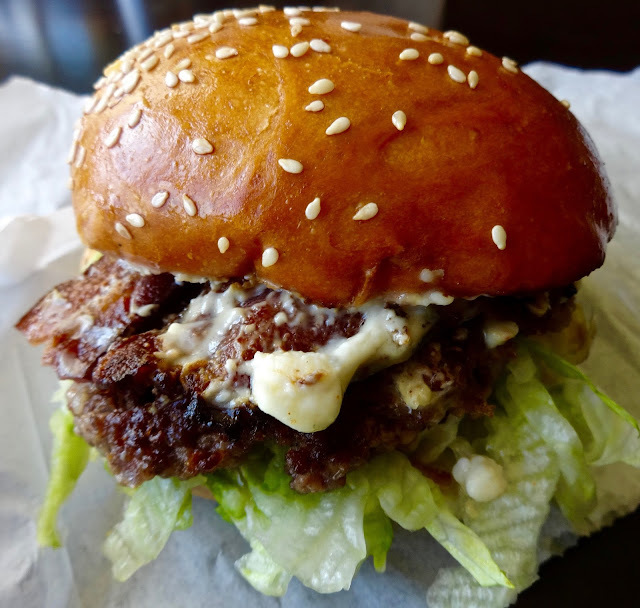 The bacon bleu cheese burger with lettuce and mayo on a toasted sesame seed bun. The single patty was $8.25. A double patty burger will cost $2.30 extra. I'm guessing this is about a 4 ounce patty and size wise, they aren't the biggest one you are gonna get in this town. More palm of your hand than two hander to eat kind of thing. They are close to the size of the ones you get from Super Duper Burger, though SDB's already come as 2 patties for about the same price. They are cooked to order so you do get a nice hot juicy burger fresh off the griddle. Tasting things all in one bite all I could taste was the bleu cheese. I like bleu cheese, thus I knew that going in. Bleu is such a strong flavor even the smallest portion can overwhelm most anything it is paired with. So know that beforehand, if you are not a bleu cheese fan, this is not for you. When you bite into it, texture wise you know there is bacon, beef and lettuce there with crunch and chew, but it all comes with a tangy bleu cheese flavor. I did break out some of the components to taste individually and the bacon was nice and smoky though the burger patty kind of just tasted like hamburger, as in no seasoning--no salt, no pepper, no whatever. Maybe a little tomato or onion might have been nice too. For the most part, while I'm not a fan of the pricing on this size burger (could be a $1 or so less) I liked it enough, maybe not enough to run out and try it again, but still, enough. 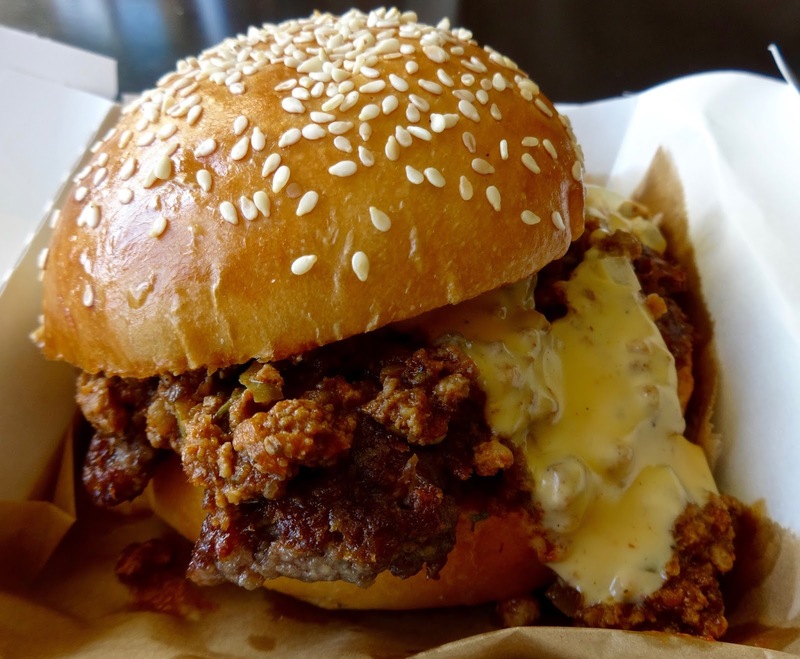 The chili cheeseburger with onion and special sauce on a toasted sesame seed bun for $8. Size wise, same as above. Difference here is they do pile on the chili to overflowing. This is an eat with utensils or get yourself messy burger. The special sauce something like you'd get on a big mac but for me that was like a secondary thing. In addition to the burger you get a heaping bunch of chili that's akin to a sloppy joe--chunks of meat, onions, green peppers and a little on the sweet side. To offset that is the cheese sauce dripping out. All together it was like a nacho sloppy joe on a bun--all the worst things you could possibly eat in one sitting and I enjoyed every bite of it. I even liked it enough to just look past the cost/size ratio thing I have. It is like a childhood memory wrapped in brown greasy paper. While it won't help my arteries any, it definitely hit the taste button square on for me. 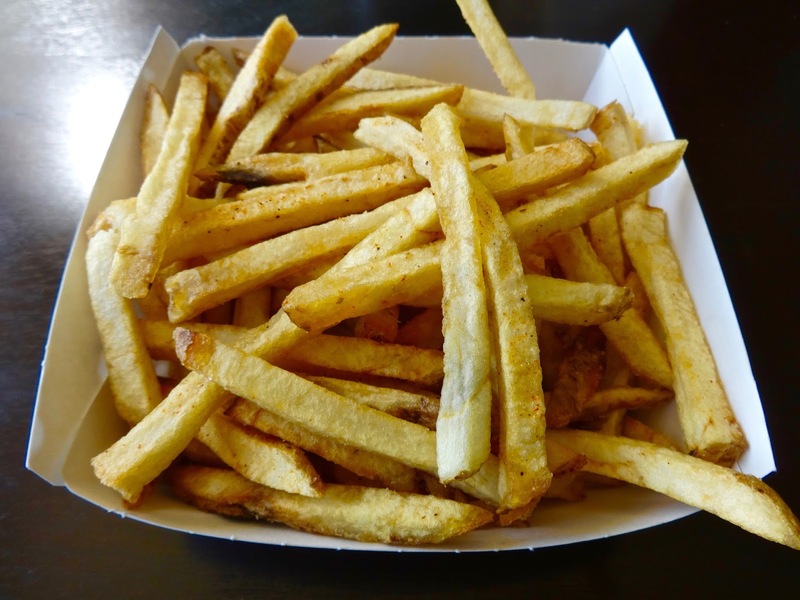 And of course, what would burgers be without fries. They offer regular, seasoned (with Old Bay) and chili cheese versions featuring that gooey meaty stuff from the previous burger. Had I known the chili was tasty I might have gone that route but on a first try I got the Old Bay seasoned ones for $2.75--which is pretty much in line with what fries will cost you at other places. It is a nice size portion and you get enough Old Bay to taste it without being overwhelmed into thinking it's a crab boil something. Thin cut and crispy outside and soft inside. A nice little side to compliment a burger. 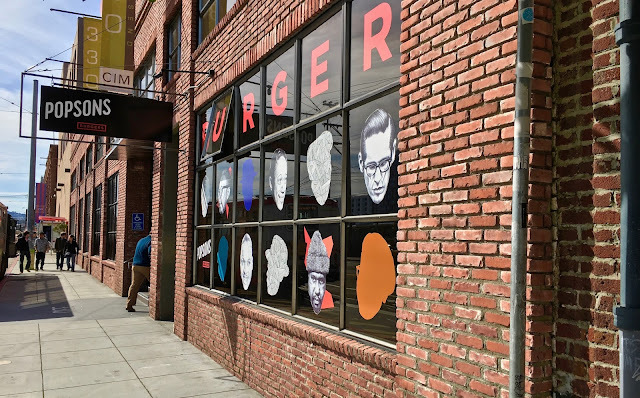 Let's face it, burgers abound in San Francisco and there are innumerable lists saying which ones are better than others and so forth. Everybody has their favorites and can probably argue endlessly why it's the best and blah, blah. While Popsons Burgers isn't really reinventing or elevating the burger with this semi-permanent location (till they open a Market Street location), the offerings, particularly of the chili variety are tasty and worth at least a try for its sloppy joe-ness--that includes the chili fries too. Eating them may not send you into some burger nirvana state of bliss, but they'll probably satisfy your burger craving with only a modest impact to your wallet.